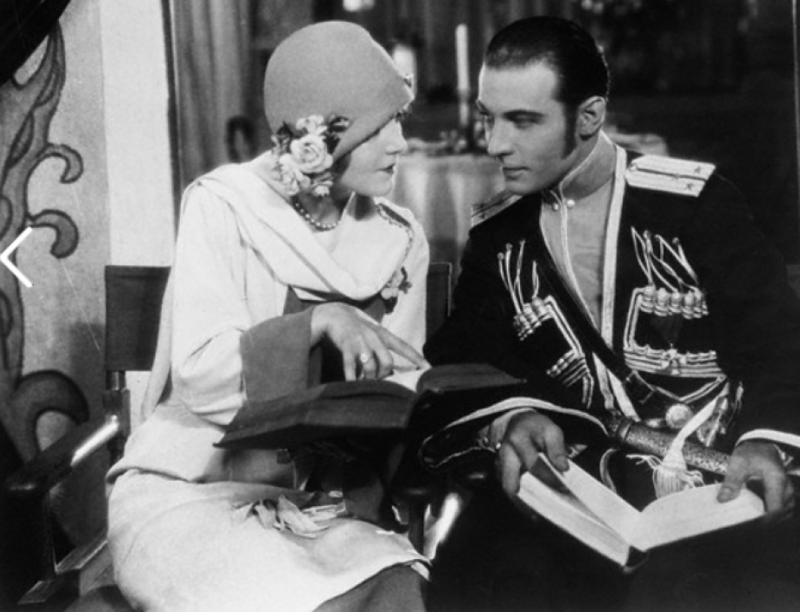 Rudolph Valentino, the famous cinema actor who just arrived from America, was the centre of an extraordinary scenes at a West End Cinema theatre, where he personally attended the occasion of the screening of one of his films. He was surrounded by a seething crowd, mostly women. The police forced them back and the doors had to be locked after the performance. Valentino rather than face the crowd which remained in the street, had to escape over the roof of the theatre. The slinkingly frocked and perfectly turbaned Natacha Rambova is carrying on at her modernistically fronted shop a few steps off Fifth Avenue daily. Her salon is a junkle-jumble of bags, perfume, objects d’art, Indian scarves, antique jewelry, modern costume jewelry, and Persian brocades. She opened it shortly after the passing of Rudolph Valentino and it is a flitter of black glass and chrome. Miss Rambova chief diversion is attending spiritualistic seances and is said to be convinced she has received numerous messages from the film star. Winifred Hudnut alias Natacha Rambova reached Chicago today, enroute to her secluded home in New York with a pledge of love for Valentino on her lips and tears in her eyes when she heard the latest news of the screen idol. All the way on her trip from Los Angeles she steadily refused to discuss the case, which scores of news reporters who guarded the train at almost every station or who were already on it when it started, but at the last moment when someone suggested her silence might result in misjudgement of Valentino and asked her if she loved him, her lips formed one word “forever”. then she resume her attitude of silence. Persons on her train said she told them she would “never never leave” Rudolph but planned to return to him one day. The only time she had real joy on her face was when the porter gave her telegrams from Valentino. Funeral services were conducted for former vaudeville and silent film star Dorothy Dalton. Miss Dalton, 78 died at her Scarsdale New York home. She co-starred with William S. Hart and Rudolph Valentino and was the widow of Arthur Hammerstein the uncle of Oscar Hammerstein II. Survivors include a daughter and a grand daughter. An income tax lien of $6,490 said to be the amount due to the federal government on Rudolph Valentino’s income for 1924 was filed here yesterday against the estate of Rudolph Valentino, silent film star who died recently. Consider this, if you will Louise Fazenda has never seen a Valentino motion picture. She just hasn’t got around to it says Louise, but she hopes to soon. Louis has the most interesting story on meeting Gloria Swanson when they were working together on the Mack Sennett Lot. She saw Gloria the other day, for the first time and did not recognize her. Louise was having lunch with two books on her lap, one was a Schnitzler tale and the other was by D.H. Lawrence. If it jars your sense of the eternal fitness of things to think of Comedienne Fazenda reading Schnitzler remember there are stranger incongruities that that in filmland. We’ll be finding out next, perhaps, that it is Bull Montana’s secret ambition to play Peter Pan.